Soccer is the one of the popular game is the word. 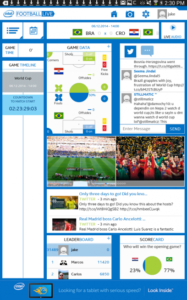 Consolidated Top 5 best soccer live score apps for millions of soccer fans. Highlights of top 5 best application for mobile can be downloaded and enjoy soccer fever :). 2) Onefootball Adidas & EURO 2016 – One of the best Football Apps for Android to Watch live Euro Cup Score. It supports the push notification and latest update of score. App also provides UEFA EURO 2016 Match statistics, Fixtures and calendars. Detailed player profiles with goals and top scorers and expert analysis, and Match predictions. 3) Euro 2016 – One of my favorite app, One of the best cool UI can be used to watch online live Euro Cup Score. You can find Euro cup 2016 calendar, Livescore, Players detailed history. Team details and usual main formations. Euro cup 2016 best scorer and Match notification also available. 4) FotMob – Euro 2016 Scores – This is one of the best Android apps to watch the live soccer match. Light weight apps bring you the latest notification, fluid user interface give you detailed player history and other details and team details including Match stats, goals, cards, penalties, missed penalties, assists, and substitutions. 5) LiveScore Euro 2016 – LiveScore app is the lightweigh bring the live score. App is lightweight and bring the live score without any delay. If you are using any interesting Best Soccer Live Score Apps in iPhone or any mobile device then comment, It might help some other football fan to get the updates and match statistics.